...that is when I saw this ad in Early American Homes magazine (now Early American Life.) 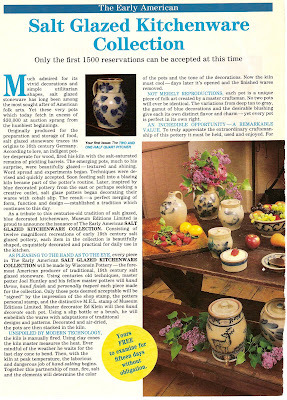 It was for a subscription to buy 12 pieces of Early American Salt Glazed Stoneware through Museums Editions Limited. I am often asked when or where I bought something and like so many of the pieces in our home, I started my stoneware collection about 20 years ago - with this subscription. 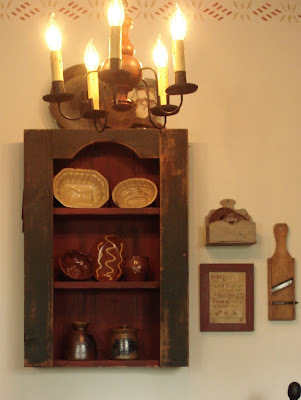 I had seen pictures of antique pieces of salt glazed stoneware in magazines but there was no way I was able to buy antiques, but there were and are great reproductions available. Salt-glazed stoneware pottery was originally made hundreds of years ago in Germany and has been made in this country since the early American settlers started to fire it. Salt-glazed stoneware pottery is glazed during the firing process. When the kiln reaches a certain temperature, salt is thrown inside the kiln and it vaporizes. That vapor reacts with the silica in the clay to produce the glaze on the surface of the pottery. In this subscription, each piece was made by Wisconsin Pottery and Joel Huntley and his master potters in that old fashioned kiln fired method. Each is also stamped with M.E.L. for Museum Edition Limited. This is the original 2 page ad I saved from the August 1990 issue of the magazine. 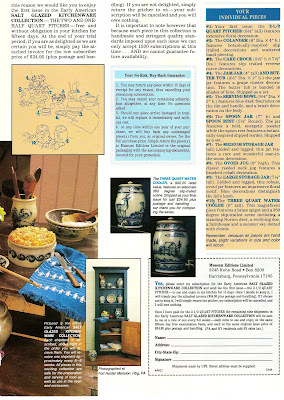 You can click on these to see the stoneware better and read about each piece if you'd like. Once you signed up and the first piece was shipped, then every 6-8 weeks you would receive another shipment of one large piece or two small pieces. Each shipment cost $34.95 no matter what the size. When I saw this ad, I was a young mom, working a few hours a week in the nursery school and this was the perfect way for me to start a collection of salt glazed pottery in an affordable way. Finding pieces in my neck of the woods was not easy. And the pieces in this collection were also meant to be used every day which made it very attractive indeed. 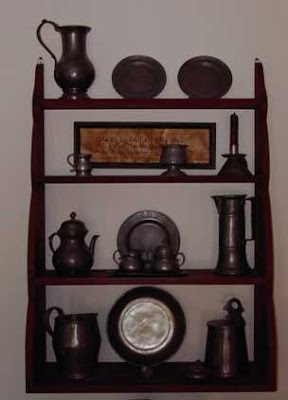 The first piece that was sent out was a 2 /12 quart pitcher shown here in the back left along with some of the other pieces. The piece on the back right is always sitting on the microwave and stores our coffee - the coffee maker sits to the right of the microwave. 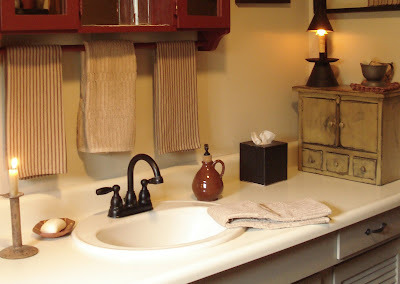 The piece in the left front is usually in the bathroom downstairs and holds the Dixie cups by the sink. The ad explained in exactly what order each piece would be shipped and this water jug below was the last piece that would be sent out. Great marketing there - you could cancel the subscription at any time but who wouldn't want to continue until you got this beauty!! They reeled me in for sure! This is great when we have a crowd and I mix up ice tea or lemonade or even ice water with lemon slices. The three pieces shown here are used all the time Behind my Red Door. The piece on the top is a batter bowl with a handle on one side. The piece on the left in the second row is a colander and I use it all the time. And the piece to the right on that shelf is a casserole dish and I love how nicely it cleans after baking something like mac and cheese. 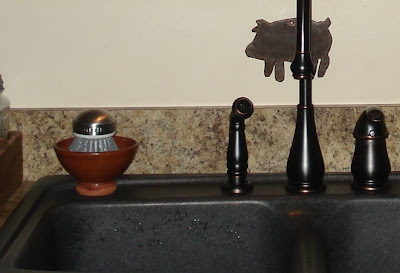 The spoon rest sits to the right of the stove and is used all the time as well. The batter jug on the left is not part of this collection - this is made by Crocker and Springer of Elash, Illinois and was made in 1993. The jug next to the lamp was part of the subscription. And rounding out the 12 piece subscription is this 1/2 gallon jug I turned into a lamp, as I have done with several other jugs. At one time I could but the lamp kits locally, but no longer. I do know that they are available through Factory Direct Crafts though. When I was looking to have additional utilitarian pieces of stoneware, I was fortunate to purchase this creamer and sugar set ... as well as our butter dish by from Crocker and Springer in the mid 90's. We use these pieces all the time as well. Another of my favorite potters is Eldreth Pottery from PA. If you have are in the Lancaster area, there are 3 places to get this stoneware. I love the darker color of these pieces. I also own these two vases from Rowe Pottery and this antique piece of F.B.Norton Stoneware. One of my treasures!Click here to see what a similiar piece of F.B.Norton is selling for... I did not pay anything even remotely close to that price for mine! Thanks so much the prim friend who asked me to show my stoneware. 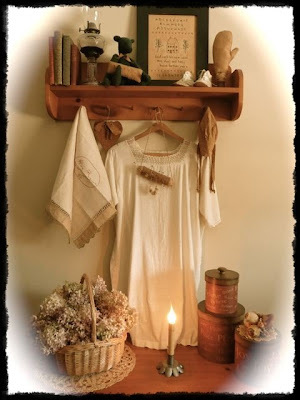 It was fun to step back in time and I know a lot of gals who are looking to find more colonial items for their homes, and salt glazed stoneware certainly fits the bill. Now I need your help!! 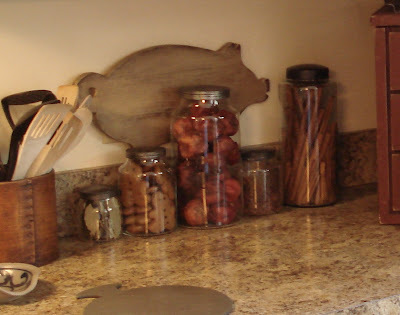 Does anyone know of an ONLINE source to buy jars like these... specifically the tall ones with dark lids? They have to be like these and the source has to be online. It's not for me I am asking - it is for a friend. EDIT: SOURCE FOUND! THANK YOU!! If you do, please leave me a comment with the source and URL if you know it. Thanks so much! Edited - several gals have asked about the gingerboys in the jar. Click HERE to read about how I made them and there is a link to the recipe on Colleen's blog as well! A few folks have asked about Momma Duck and her 11 eggs. As of this morning, she is still sitting on them. We are getting anxious to fix our driveway so we are hoping they hatch soon. I'll let you know when anything happens! 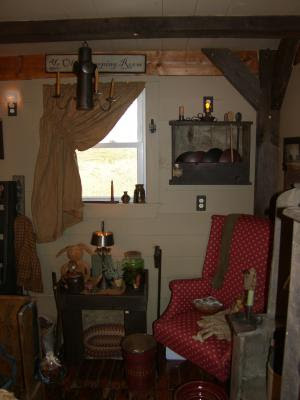 Yesterday I had the pleasure to chat on the phone with Jen from Taylors*Farmhouse*Attic. The time flew by and it was so much fun talking to a kindred spirit. If you haven't been to Jen's blog, stop over soon! She is a sweetheart and talented decorator and stitcher as well! Before I say good bye for today, I want to thank all of my followers and anyone else who takes time out of your busy life to come by my blog regularly. I appreciate each and everyone of you!! As you might remember, the head of a company survived 9/11 because his son started kindergarten and he decided to take him instead of heading straight to work that day. The one that struck me was the man who put on a new pair of shoes that morning, took the various means to get to work but before he got there, he developed a blister on his foot. He stopped at a drugstore to buy a Band-Aid. That is why he is alive today.. If you read my previous post, I mentioned that my friend was coming for lunch on Friday and I set my table all patriotic for us. I also mentioned I was going to try Colleen's recipe for Spinach, Strawberry and Feta salad. Well it was even better than I imagined. It was simple to make and Ina and I both loved the sweet n sour dressing. Ina's grandmother lived in the PA in Amish country and Ina has many of her old time recipes. She has made a salad for me a few times with a similar dressing that also has bacon in it and it served warm so I knew she would enjoy this one. This is a real keeper!! Oh and the dressing recipe makes a lot more than you need for one salad. 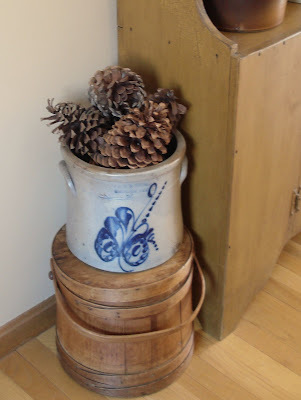 I made it up in a canning jar - easy to mix and store. DH does not do feta so the next day I made us both the same salad but used some sharp cheddar in his and he loved it that way. I imagine a sharp blue cheese would work too. Try it sometime when you see fresh strawberries, you won't be sorry! I also served a white meat chicken salad I made with Vidalia onion, celery, slivered almonds, dried cranberries and a little mayo. I poached the chicken breasts and I always save some of the poaching liquid for the salad. It cuts down on the amount of mayo you need. This is best made ahead so the dried cranberries soften a bit. And we also enjoyed some stuffed grape leaves (not homemade) and a sunflower flax seed whole grain bread - both from a wonderful family owned farm stand just minutes from My Red Door. It was yummy and good for us too! My friend had a last minute phone call and a family member needed her help, so she called me to say she was delayed getting here. So what did I do to kill time waiting for her?? And this weekend, in between chores and yard work and getting ready for tomorrow's cookout, I took the plunge!! I did it! For quite awhile now I have had the picture below on my side bar. It is a picture from my friend Kathy's gorgeous Home on the Hill. I saw this in her bedroom when i was there in late March. It also happens to be the logo for A Primitive Place. Late last year we had the honor of having our home's holiday pictures as their first ever Featured Home. We are also featured in the members gallery. But until now, I have not had the time to join the ever growing forum hosted there. After both CS and MG articles came out, I was very busy answering emails and requests and question from all over the country. 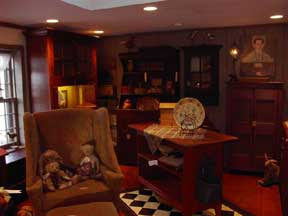 And then it was time to work on DH's office, the nursery, the baby shower, the garage doors and so many other projects. But with those big projects behind us, and no vacations until the fall planned and knowing I would hibernate inside with the a/c once the heat starts, I took the plunge and joined. And I have to tell you, they are the nicest group of gals and I received the warmest welcome. I have known several of them for a few years from Webshots and some of our favorite bloggers belong as well but I am also meeting some other really kind folks there. 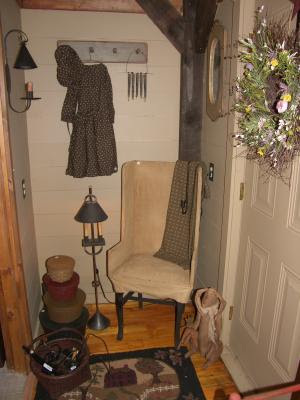 So if you love prim/colonial/country decor and have the time, click on the picture and join us! Do I ever steer you wrong?? Of course not!! The next time I post, I will be answering a request from a friend to play show and tell with my EAL stoneware collection. I need to work on making some pretty pictures of all my pieces. If you like that kind of stuff, make sure you check back later this week. And enjoy the rest of this long weekend! We are capping ours off with a family cookout tomorrow. DH is starting the summer grilling season off with a bang and treating us to porterhouse steaks. YUMMO! So what do you do for the unofficial start of summer? 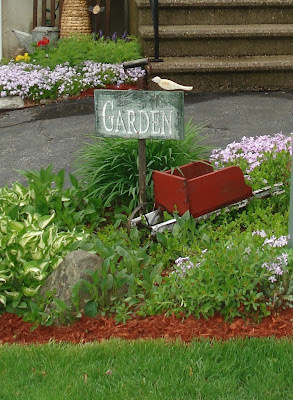 Do you attend a local parade, have a cookout, plant your annuals, decorate for summer? Behind My Red Door we all of the above. As much as I don't like rushing summer just to avoid the heat, around these parts there is no getting away from it come Memorial Day weekend. So if you can't beat um, you join um, right? Just hearing that we were getting temps nearing 90was enough to motivate me to get my annuals in the pots and get my summer decor out of the attic before it turns into an oven. And yes, we did get one a/c out of the attic too - the bedroom one. Just knowing there was someplace to escape to made me feel much better. Isn't that true about many things? We can endure if we know there is an end in sight? I am like that when working in my garden. I can spend a few hours in the heat working away, knowing I can some inside to a cool house. If we didn't use a/c, you would never find me out there working in that heat! Yes, that works for me! 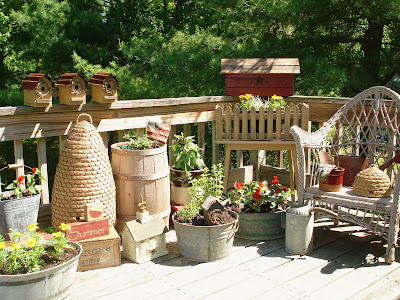 I even added a little bit of both on the deck with my container plants. Unless and until we get a screened porch here, we don't use the deck very often. It gets too much direct sun all day and an umbrella just doesn't cut it. We can't use those wonderful screened canopies either because of the roof line. 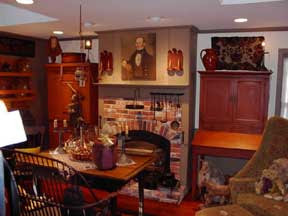 But because we see this area from the kitchen and dining room so I make it fun to look at - for me and our guests. or two! and how about a Garden Angel to watch over us.... yes indeed, that will do! And to answer that certain someone who keeps asking, I know it seems like ALL I do is shop and decorate because that it what I choose to show you but I really do have other things in my life. Like my family and friends and laundry and yard work and volunteer work and cooking and cleaning and so much more. I just post about the fun stuff. I don't choose to share too many details about our family, because they didn't ask to be blogged about. And I am the Keeper of our Home so that is my job after all. I also happen to be at a stage in my life when I have the luxury to be at home and so it is of course a big focus of my time. For all things there is a season, and I am truly enjoying this one. In a few short weeks, my focus will once again change when I become Grammy to Liliana. Angela is already dilated 1 cm and while that can be a slow process, it can also mean Liliana will be here sooner than expected. So in light of that, I am cramming in as much fun as possible before I move into that new season of my life. Not that it won't be fun, but I will be busier with our first grand child and have less time for other things and believe me, I am sooooo good with that. And doing lunch with girlfriends is one of those fun things I am doing while I can. Tomorrow my dear friend Ina is coming to lunch. Before it got too hot today, I set us a pretty table using an old Patriotic doll another friend gave me years ago. Her body is made from an antique pillowcase that came over from Sweden. And it is a good thing I set the table and uploaded my pictures today because I almost forgot to add the water goblets..... much better! One of the items on the menu is a Strawberry, Spinach and Feta salad I saw over on Colleen's And Baby Makes Five blog. My mouth was watering just looking at the picture. She include the recipe so if it appeals to you, you might want to check it out along with all the other strawberry goodness she shared. It is chuck full of prim and Patriotic goodness! Now that is what I call a perfect weekend activity! So what are your plans for this Holiday weekend? Leave me a comment and tell me! I'd love to hear all about them. In some blogging business, I want to point out an error I initially made in my last post. See my new covered jar on the bottom right? I initially said it was made by Turtle Creek. But after Rick Hamlin left me a kind comment (he was so kind and didn't point out my error) I immediately realized my error on my own and corrected before many of you even read the post. I wanted to make sure everyone knows that is one of Rick's wonderful made in Massachusetts and LEAD FREE Pied Potter Hamlin pieces. The piece on the top right is also one of Rick's pieces. Please do check his website if you have a moment. I am hoping to get to one of his programs in September at a Home Depot not too far from here. I have always admired his redware and I would love to see him at work! And last but in no way least, because the real reason for this holiday is to commemorate those who lost their lives for us, I want to thank all the men and women in uniform who serve this country so proudly. My solemn prayer is that each of you returns safely to your family after so bravely serving our country. I salute each and every one of you. God speed. I love our home. I am not trying to be conceited but I needed to say that because I guess I have said so many times that it is not my dream house that I gave a few people the wrong impression. Honestly, I really don't think many people live in the exact style or size house that they would if they had free reign and an unlimited check book. But that doesn't mean we don't LOVE our HOMES. I love ours. Even though compared to many in our town, even some just up the hill from us, our house is very modest, I know how incredibly blessed I am to live here. I also know that compared to many in the world, I am INDEED incredibly blessed. I realize that being able to live in a 3 bedroom home, with an eat in kitchen with modern appliances of my choosing, and a formal dining room and living room, and huge family room with a fireplace, and 2 large bathrooms and lots of closet space and a big 2 car garagTe and a large yard bordered by a brook in a wonderful neighborhood in this awesome town alone makes me incredibly blessed. 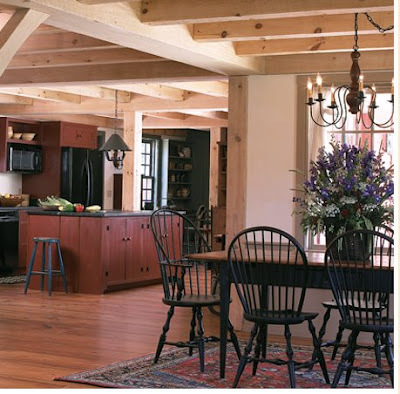 But to also have the ability to furnish this house the way I have, and to make it into a home that greets family and friends with open arms, that shelters them in times of need and celebrates all the milestones of life, is just the icing on the cake. Please know that I NEVER ever take it for granted. So when I say this is not my dream house, it doesn't mean it is not where our dreams come true. Because they do and I know I am blessed to live here. Some might even say we are very lucky to live here but my DH will insist that the harder we studied in college the first time around and then the harder we worked and saved (MY ENTIRE PAYCHECK for over a year) and gave up as newlyweds(no fancy honeymoon for us) , and then the more we studied when we went back to college as young parents (studying when everyone else went to bed) and then worked harder still - the luckier we got. Yes, we are blessed and lucky! 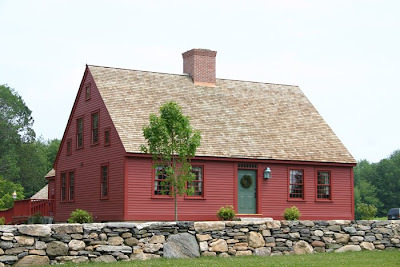 Do remember when I blogged about Early New England Homes and I shared some pictures from their website? Well any one of those could be my dream home and my friend Jill and I got to see the model home in person yesterday. 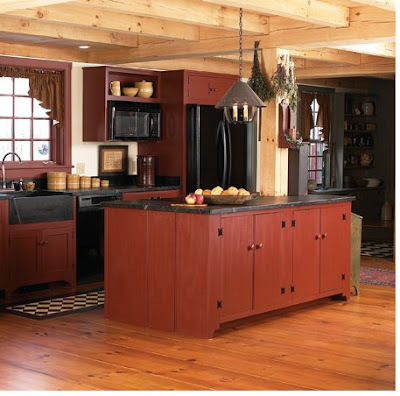 This red kitchen - well if you ever get to have a red kitchen - go for it. After seeing this in person, I want one! 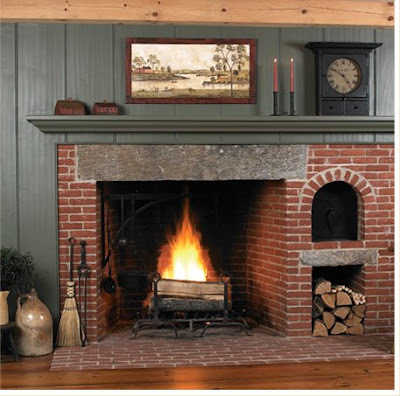 And if you ever get to have a fireplace like this, go for it! And if you ever get to have this much open space, go for it! Yes, I could easily call this my dream home. But in the meantime, I will make this one, the home of our dreams. Of course to do that, a girl needs to do some shopping. And I am determined to do my part to help the economy and support American businesses. And I did just that this weekend. Jill arrived Friday afternoon after doing her part as well. 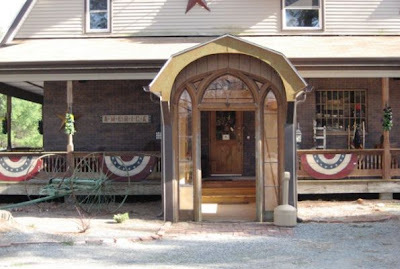 She spent the day at the Brimfield Antique and Flea Market about 40 minutes from here. Luckily for me, she arrived with some hostess gifts for feeding her and putting her up overnight Friday. I love this antique grater she found for me. I found the little tin shaker next to it on our shopping trip on yesterday And she surprised me with these old spectacles, the Declaration document and the old blue book in the back ground. 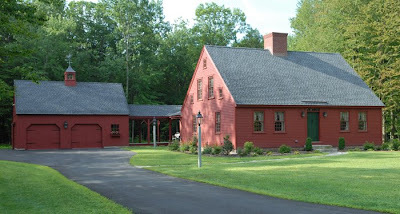 We started out bright and early in the morning and I drove as we headed southwest to Bolton, CT where we stopped first at the model home shown above. After touring the home and decided we'd each take one, we headed next door to Tessier's Changes of Thyme. Girls, if you are ever in the area, this shop is a must on your list. I have seen many nice prim and colonial shops in my day and this is right up at the top of my list. I am saving my pennies for my next chance to shop here. These pictures are from their website. 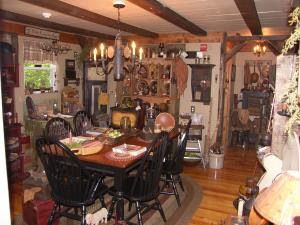 Start holding your mouth closed now.Jerrie and Norm Tessier have the nicest colonial and primitive items to furnish a dream home. 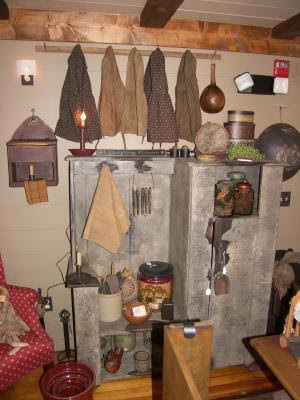 Furniture, red ware, stoneware, pottery, pewter, art work, lamps, bedding, dishes, towels and so much more! Want to see more, check out the link above. I had decided that even though we had several stops to make, that from now on, I would rather come home with a few quality items, than many small things that would go out of style in a few years. I used great restraint and I got just 2 things even though I saw hundreds I would like. I found a great pillowcase from Family Heirloom Weavers to coordinate with my coverlet. And for all you bloggers who want to see my house in it's every day look - here you go. Wrinkled sheets, alarm clock and phone in plain view even - just for you! This is how I make the bed every day. Some of you may have noticed the peg rack over the chair wasn't there the last I took my pictures of our bedroom. And the chair is different too. My mom gave me this old chair and I love it. Thanks mom! And now that my Christening dress is on the peg rack, you are wondering what my dresser looks like now. I should say FOR NOW because who knows how long it will stay this way... I also bought this gorgeous piece of redware from Pied Potter Hamlin NOT Turtlecreek as I mistakenly posted earlier - I have always loved this piece and admired it in other homes. 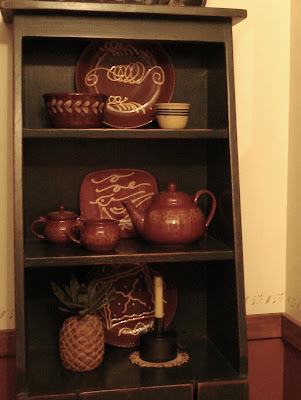 It joins my other redware in the dining room. More about that in a bit. Back to the trip! 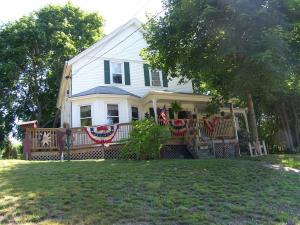 From there I entered 114 Danielson Pike, Foster, RI into the GPS system and we headed to Things Made Wonderful. This was an interesting store. Many imports and country items downstairs so not my favorite but they had a great supply of curtains and linens so I was able to find the coverlet style valance my friend Carolee from Autumn Mom Patches of Godlight wanted. Upstairs there were several antique and craft booths and that is where I found my little tin shaker. Jill, who had shown more restraint at Tessier's, found some great treasures. A jug crock, a yarn winder, and a child size rocking chair. 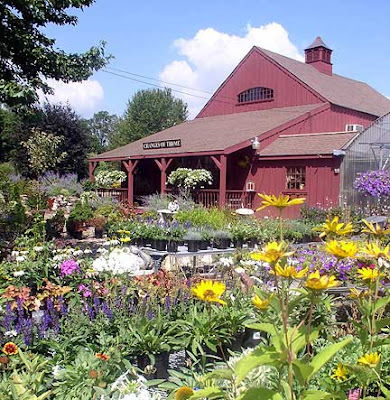 When we left there we found our way to a few more shops and before heading back to MA we stopped at Toadally Country in Cumberland, RI. I will be honest and tell you that I almost did not add this shop to our itinerary because of it's name. I planned our trip partly on the listings in Country Register and partly from recommendations. I decided to check the store website and shop pictures and was pleasantly surprised. And when we got there, we were not disappointed either. These pictures are from the website. I found this great quilt in the perfect shades of tan, gold, reds and black. It is just what my deacons bench needed. I really love how it pulls in all the colors from all this end of the house. It was a really fun two days with Jill. She enjoyed trying some of my favorite salads and it was fun to cook for her. We are now thinking of a trip to PA together sometime in the future. Aunt Daisy's here we come! A few of my blogging friends asked me about my redware and what it is exactly. 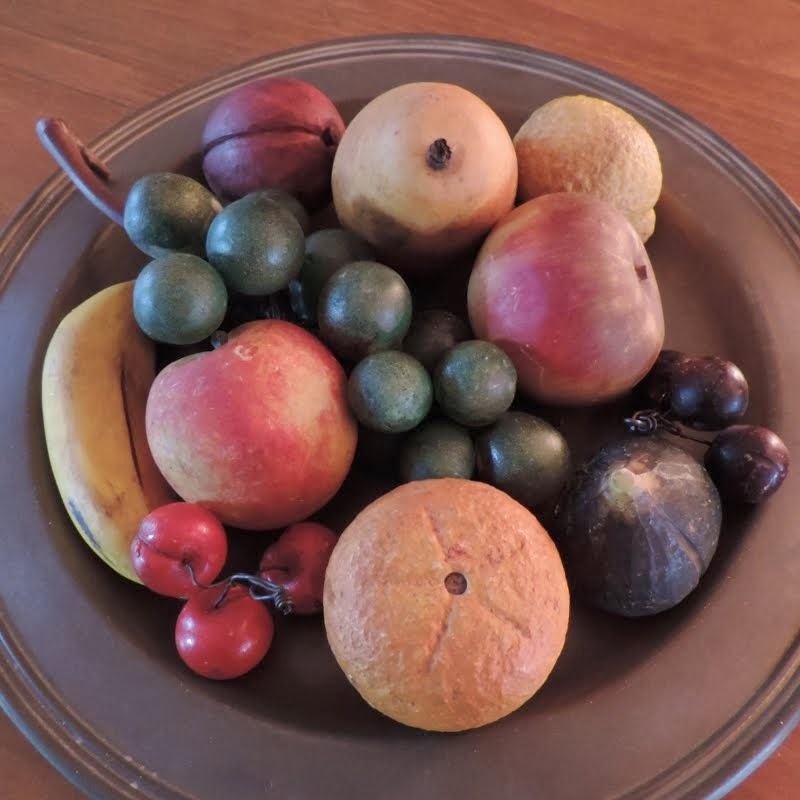 "REDWARE, also known as terra cotta, is a variety of earthenware whose body of soft porous clay turns red, orange, or brown when fired due to its high iron content. 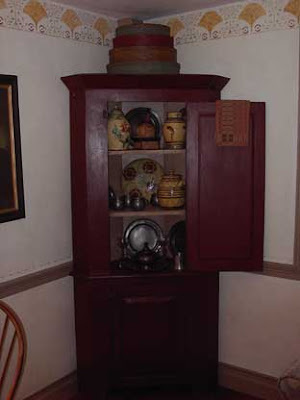 Pieces of European redware were among the household goods of the earliest English settlers, and redware was imported commercially throughout the colonial period. Domestic production in America started as early as 1625. Most, but not all, redware was covered with a glaze, either clear or colored. Particular glazes were sometimes associated with particular wares, such as the distinctive blackish-blue glaze used on English "Cistercian" ware. Further decoration might be added through a variety of means including painting, sgrafitto (in which lines are scratched in the body of the piece) and slip trailing (in which designs are "drawn" with a liquid clay mixture of a different color). The widely-traded 17th century German redware called Werra-ware combined all these techniques to great effect. " 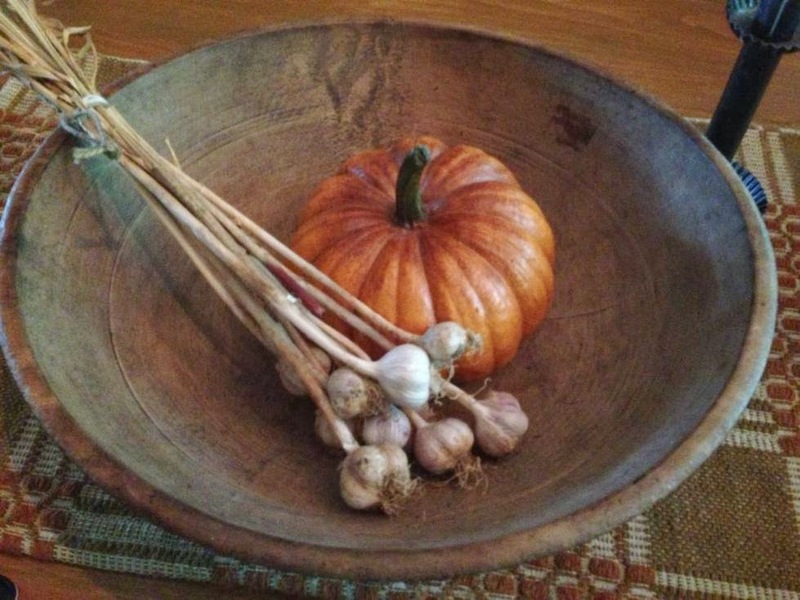 Taken in part from Julia Smith Redware. I have been collecting redware since we first moved here in 1986. Many but not all of my pieces come from PA because the red clay earth is so readily available. 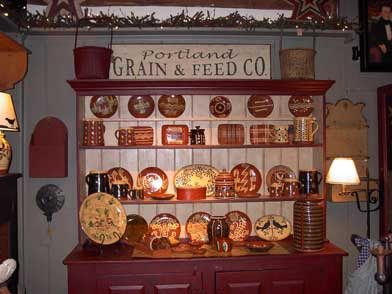 A friend, Tracy Cogan, owns a store in Bethlehem, PA and she first taught me about redware and and I found several pieces when we would go to the Lancaster area on family vacations. For those who wanted to see more of collection, is scattered around the house so here are some pictures of just part of it. My pieces are made by a variety of artists including Ned Foltz, Stephen Earp, Hendersons, Wilz, Turtle Creek Potters, Lester Breininger, Eldreth Pottery, Wisconsin Pottery and Greg Shooner. They each have a different method to sign or mark their pieces. I especially love the marking from my large platter made by Greg Shooner. This was a gift from my school staff in 1995 when my sister and DH gave me a surprise 40th birthday party so it is a treasured piece. This is the back of it... it is almost as pretty as the front! Well that is it for show and tell tonight. Before I go and watch Survivor, I'd like to give a shout out to Audrey from Ashby, MA. My friend Bonnie said she met you at the craft fair on the common in Townsend and that you read my blog. How cool that you met a friend of mine! Thanks so much for reading my blog! If you any of you are looking for more great blogs to read, Rue over at Rue's Peanut Butter and Jelly Life has compiled a list of recommendations from her readers. Rue's blog alone is worth visiting. And her home new old home is darling! I have already found some fun new blogs to read and I am sure you will as well. And I am honored that my blog was recommened to be on the list. Thank you so much. I know this is a long post and I hope it doesn't disappoint. Next time I come back, I have some more dream homes pictures to share and I will answer another request of a faithful reader. And just maybe, Momma Duck will have some ducklings - we think it is close to the time!